This weekend marks the fifth anniversary of Small Business Saturday, a day that shines a spotlight on all the amazing small and independent businesses across the country in this busy Christmas shopping period. 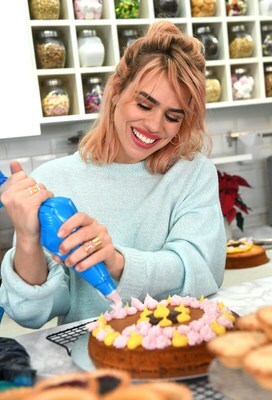 To celebrate, Billie Piper, a passionate supporter of small businesses, decided to step off the London stage and don an apron to help out in her favourite local shop in North London - The Cake House. While at The Cake House, Piper alongside the café owner, Lorenzo, helped out, baking and icing cakes to encourage everyone to get out there and support Small Business Saturday. Lorenzo has owned the café for over 15 years making it an integral part of the community in which Piper and many others live. Small Business Saturday sees thousands of small businesses all over the country take part every year since its inception. According to research undertaken by American Express, founder and principal supporter of Small Business Saturday, last year a total of over £717 million pounds was spent by shoppers on this particular day. 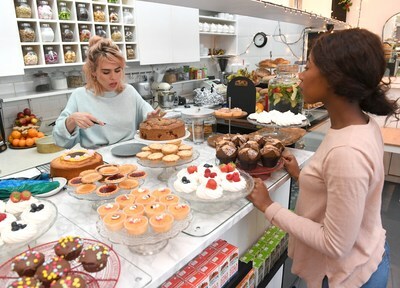 Piper partnered with American Express to celebrate the United Kingdom's thriving small independent businesses, such as The Cake House, to encourage shoppers to go out and 'shop small' this weekend. 1. 3,610 UK adults were polled by Toluna between 8pm on Saturday 3rd December 2016 and 8am on Monday 5th December 2016. Small Business Saturday is a grassroots initiative encouraging people to show their support for small businesses by shopping small. First conceived by American Express in the U.S. in 2010, where it has become a key date in the shopping calendar, it has received widespread backing from numerous organisations and personalities. Now in its fifth year in the UK, Small Business Saturday UK 2017 (2nd December) aims to build on the success of previous years. As founder of Small Business Saturday in the U.S., American Express is principal supporter of the campaign in the UK, encouraging people to make the most of their small, local, independent shops and businesses. Actress Billie Piper recently won six Best Actress Awards, including the highly prestigious Olivier Award for her phenomenally reviewed starring performance in the title role of Simon Stone's sold out adaptation of Yerma at The Young Vic. She is going with the production to The Armory in New York in Spring 2018. She is much beloved from our television screens with highly celebrated performances in Showtime's Penny Dreadful, Dr Who for the BBC, the Philip Pullman series of The Shadow of the North and The Ruby in the Smoke for the BBC.